Just like many of you, we are still having very warm "unfallish" temperatures here. It has been hard to even think about fall but when perusing the blogs and linky parties I have seen so many fall projects that I thought I should at least get started. So I broke down and made a fall wreath. It's not that I haven't been thinking about fall, it's just that without the cool, crisp air to make the trees start changing I just can't get in the mood. This year I decided to change it up a bit. I decided to do fall in colors other than the usual that I do. This summer I painted a bench for our entryway and I wanted to tie the fall decor in with it. I love the black and white check. So I decided to use black and white with geometric designs. We will see how this unfolds over the next few days. I started with the wreath for the front door. I am loving it.. It turned our just as I had envisioned it. 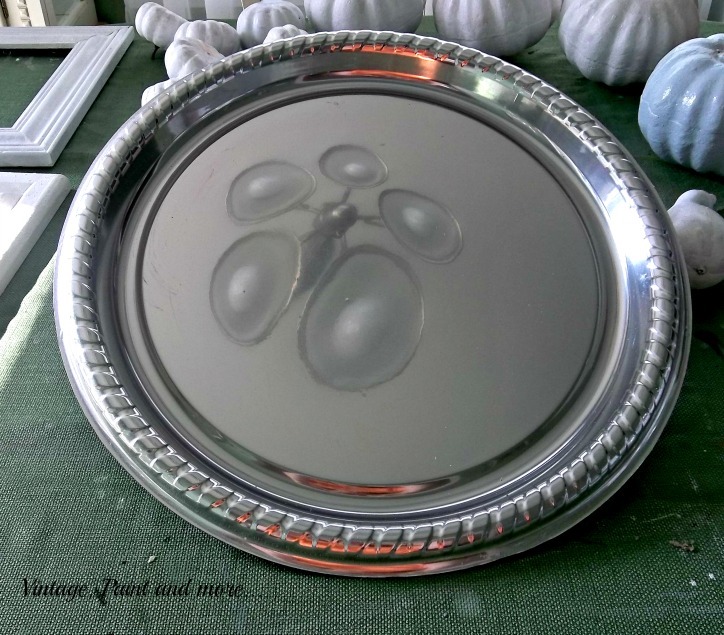 Would you believe I started with a Dollar Tree silver tray? Yep, that's it right here ( along with the reflection of the dining room light) I painted the center of the tray with black chalkboard paint. 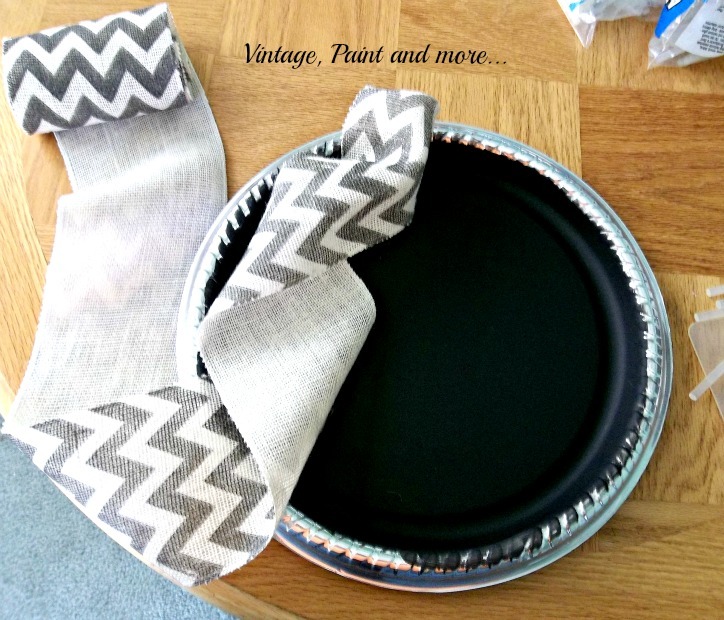 Then I used charcoal grey chevron burlap ribbon my son brought me from Hobby Lobby and started hot gluing it all around the tray. There is no real method to this. I found I just had to pinch the ribbon together and/or gather it as I went alongand glue it down. I occasionally had to go back and glue edges down that didn't lay right also. I just had to keep playing with it till I liked the way it looked. This ribbon is somewhat stiff and can be unruly at times. For the letter I free handed a "C" on a piece of paper. Then cut it out and traced it onto a scrap piece of foam board I had. I then wrapped it with jute I had on hand from my many twine projects I am all into right now. This is quite simple and takes very little time at all. Then I just glued it in the center of the tray. To hang the tray I glued a loop of twine on the back. Now it resides proudly on our front door. And I have proceeded to finish my first (of many) fall projects. Now I am off to paint pumpkins. Have you started your fall decorating yet or are you waiting for cooler temperatures like many are? 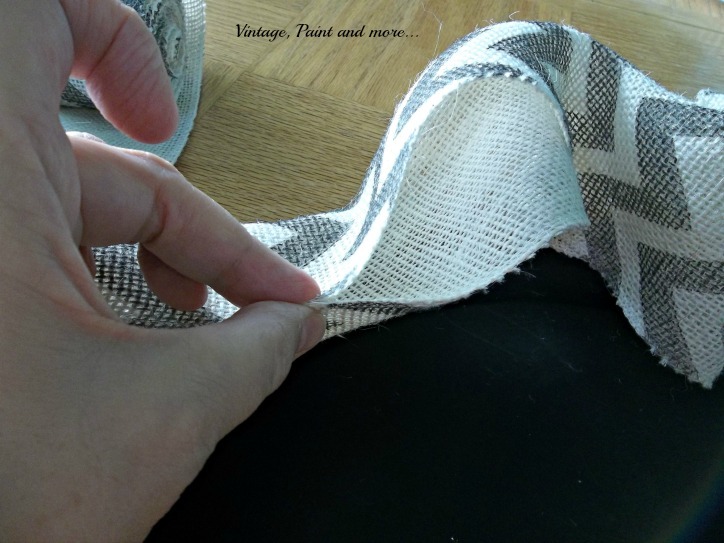 Are you making most of your projects and are you using different colors this year? Would love to hear about it in the comments. New Follower from the bloglovin blog hop. Hi Cathy I love the wreath and the little bench, really sweet. I've just found you via Life on Lakeshore Drive. 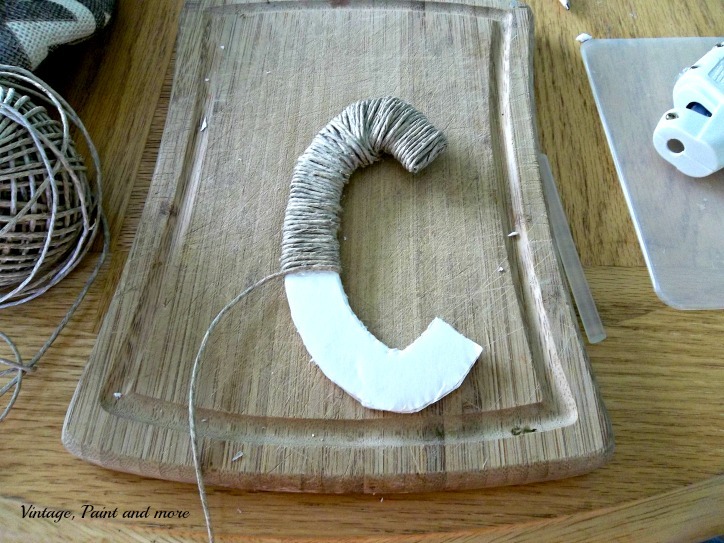 I've had a quick peek at your blog and I love your crafty makes. Hope to see lots more. I love the black and white check stool- anything with checks is great. What a clever idea for the wreath- you make it look so easys. 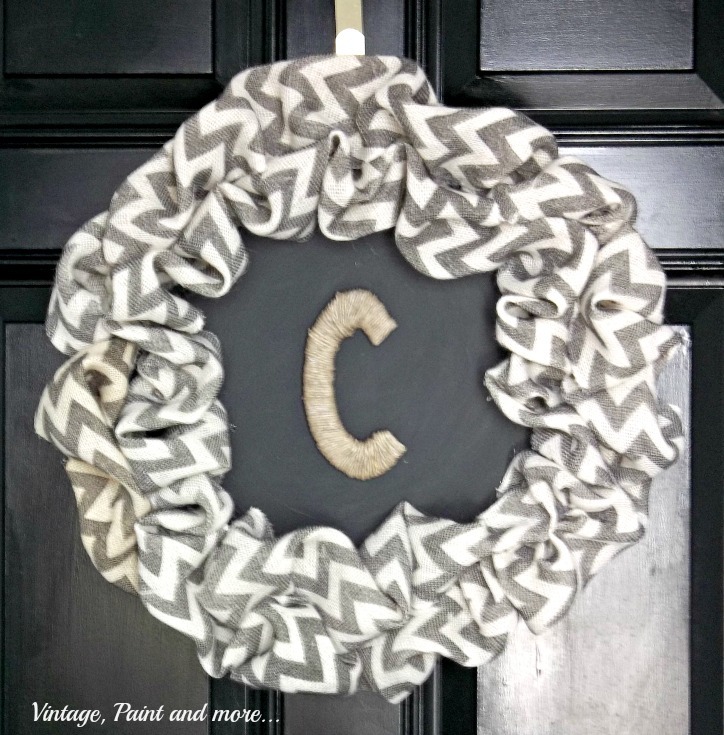 Hi, your wreath is so pretty and chevron is all the rage right now. I saw it on life on lakeshore drive! You sure can't go wrong with chevron and a monogram! I love your wreath!! 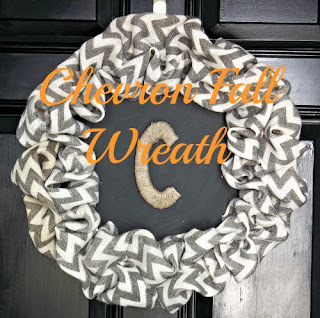 It would be awesome if you were willing to share this at the Fall Get Your DIY On Link Party: Fall Wreaths going on right now on five blogs! I would love to invite you over to the happy housie to link up if you haven't already done so! Hope to see you there!! Who would have known this started as a tray from the dollar store! Ingenious! I'm visiting from the Get Your DIY On link party. Oh my goodness, that is about the cutest wreath I have seen in a while! I have also been eying that burlap ribbon at Hobby Lobby! This is super cute. I love wreaths and need to start making them again. Thanks for sharing this on Fluster Buster's Creative Muster and I will be sharing this on my facebook page. This is a fun project! I love that chevron ribbon! I'd love for you to link this up to our All Things Thursday Blog Hop that goes live tonight at 8pm Central. Hope to see you there! Wow...I love this Cathy... What a great project and it turned out FABULOUS!!!! It turned out so cute and I love the chalk board and chevron! I love the uniqueness of making a wreath from a tray! Brilliant! Thank you for sharing at our TGIF Link Party at A Peek Into My Paradise. Your post will be featured at the TGIF Link Party this week! LOVE it, that chevron fabric is perfect for some classy Fall decor! Looks great! Thanks for stopping by DIY Vintage Chic’s Friday’s Five Features and Fun Festivities. Don’t forget to stop back by tomorrow! I love your wreath! It turned out awesome. You did a great job. Just pinned. Thank you so much for sharing with us at A Bouquet of Talent this week. You've been featured on Give On The Goods! You'll also be on my FB page today ;) Be sure to stop by and grab a button. Oh, a Dollar Store platter...genius! You did a wonderful job!